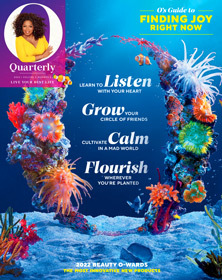 Subscribe to O, The Oprah Magazine for up to 72% OFF what others pay on the newsstand — that's like getting 19 FREE issues! SIGN UP FOR NEWSLETTERS TODAY AND ENJOY THE BENEFITS. Stay up to date with the latest trends that matter to you most. OPRAH IS A REGISTERED TRADEMARK OF HARPO, INC. ALL RIGHTS RESERVED © 2017 HARPO PRODUCTIONS, INC. ALL RIGHTS RESERVED.